Maybe you’ve noticed that I haven’t been posting as often lately. Don’t worry, I haven’t given up on blogging, I’ve just been busy chasing after some new dreams. This time, they aren’t all athletic goals… although I’ve got a few of those floating around in my head too. My close friends and family know that every couple of years I get the itch to start something new. Some may think I’m noncommittal or that I have ADD. Believe me, I have questioned that myself. But I really think I’m often changing course because there are so many things I want to try in my life that I’m not satisfied sticking with status quo. “So much to do and so little time.” Sometimes it feels like my best quality and at others like my worst fault. Let me back up a minute to fill everyone in on my stints as an entrepreneur. About six months after I left my advertising job in 2007 when our oldest daughter was born, is when I felt the first itch of self reinvention. It must have been on one of the late nights I was up feeding Elizabeth that I dreamed up my first business idea. At the time I still had two four-legged, furry babies to care for as well. I had begun using the extra produce that Andy brought home from work to create fruit and vegetable based dog treats. I baked them in my home and sold them through local grocery stores, pet stores and farmers markets. As my business grew, so did my belly… my baby belly. 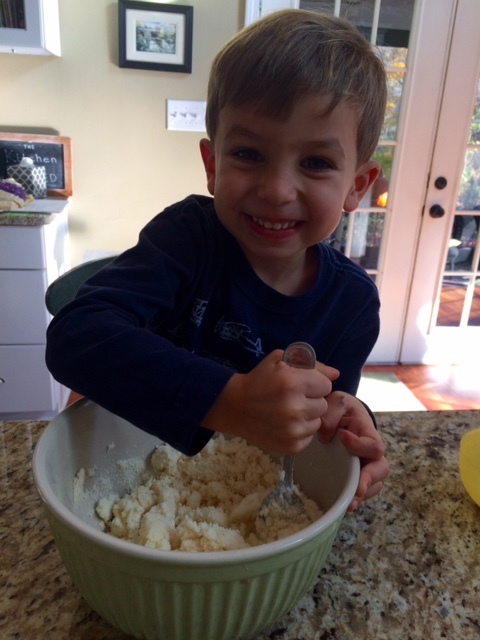 When I was pregnant with our second child, I hired someone to bake for me so I could manage running the business. It worked out well until several months after she was born when I realized I either needed to hire someone to help with the kids so I could devote more time to take my business to the next level, or put it on the back burner. 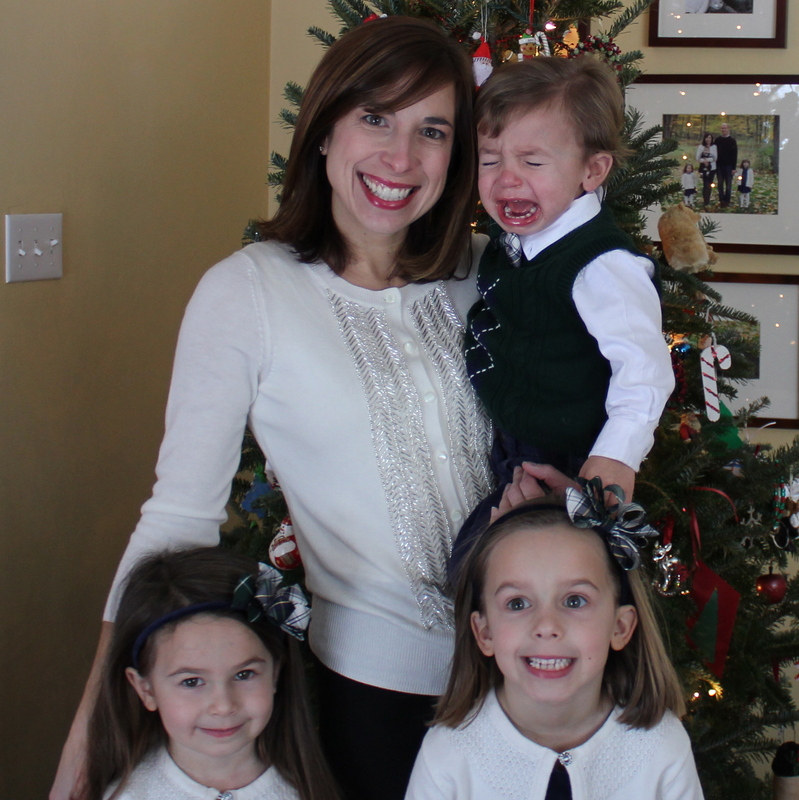 I wasn’t passionate enough about the business to delegate raising my babies to someone else. In addition, I knew the dog food industry was a very competitive market and I wasn’t confident that this little business out of my home could ever compete with the “big dogs.” So I set aside my entrepreneurial dreams for awhile. I’d be lying if I said I didn’t feel disappointed in myself for never bringing it back to life. By sharing my recipe here I feel like I’m somehow making worthwhile all those countless hours I spent baking berry, apple, pumpkin and carrot shaped dog cookies during my kids’ nap time and after they went to bed at night. When I was pregnant with John I got the itch again. This time it was the crafty part of me that was yearning for a new challenge. It started with me making barrettes and bows for my girls. Then a friend asked me to make some for her children and it began to take on a life of it’s own. I started making appliqué children’s clothing, bibs, burp cloths, pillows, nursery bedding, wall art and more. I sold them to some local stores and online. I would put the kids to bed and stay up until midnight sewing. Or I’d get up at 5 with the baby and he’d sit and watch me sew while we waited for the girls to get up. Somehow I kept it going because I enjoyed doing it so much. But once again, about 6 months later, I realized that I was trying to do too much with too little time. I was stressed and on edge and I was taking it out on my kids. So I set it aside. I still consider going back to it now and then. I began these ventures for many reasons; to express myself creatively, to have an escape from changing diapers and singing “The Wheels on the Bus” and maybe to earn a little extra money on the side to help contribute to our income and not feel guilty when I wanted to buy a pair of shoes for myself. Honestly I went through a little bit of an unexpected identity crisis when I left my job, became a mom and couldn’t figure out how to answer when my husband asked “What did you do today?” While I have always felt SO VERY LUCKY to have the opportunity to be home to care for my children all day, after starting up these companies, it felt good to have something interesting to say when people would ask, “And, what do you do?” I suppose I wanted to feel like I was contributing my knowledge and gifts to the world. Of course, perhaps by raising our children is how we do that best. But, by having my own “thing” it helped me cope with the challenges of being a mom and it made me feel a little like the person I was before I had kids. Not that I’d really ever want to go back completely. Above all, attempting to take on new challenges, allows me to continue to find new parts of myself that I didn’t know existed; new ideas, new gifts, new strength, new blessings, new passion. 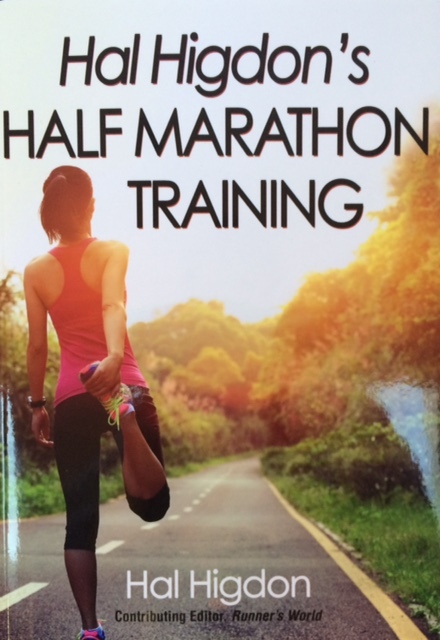 I suppose those are all some of the same reasons I began my adventures as a long distance runner and I know it had a lot to do with why I began writing this blog. I have learned more about myself over the past few years than perhaps ever before. Now, as I begin a new journey working with my husband in his family’s 100 plus-year-old produce business as their Director of Communications & Community Outreach, I couldn’t be more excited about what’s in store. I feel like all the challenges, successes and failures that have come before have somehow been preparing me for this role. Now I get to work on taking what was once just another one of my big lofty ideas (to some, maybe, unrealistic ones) that I wouldn’t let die and make it happen. I get to do many of the things I enjoy most and do them in an effort to help a community in need, while solving some of our country’s biggest environmental and health challenges. See Mom and Dad, you told me my relentless persistence would help me be very successful someday. There are certainly times when I look back at the path my “career” has taken and I second guess some of the choices I made. But I have no regrets. Every experience I’ve had has taught me something new about my trade and about myself. 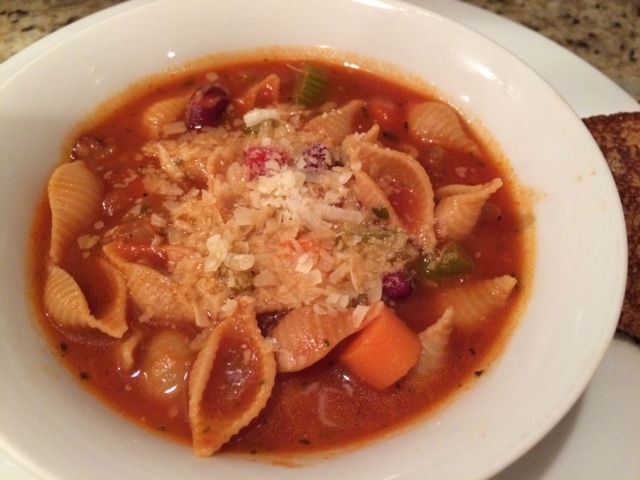 On cold, rainy fall evenings like tonight, I love a bowl of hearty soup. Here’s one of my standby recipes. Serve it with a salad, a baked potato or cook up a grilled cheese to dunk in there. The best part is you’ll have enough leftover for tomorrow’s lunch. In a large pot combine oil, onion, celery and parsley. Sauté until soft. Add garlic and cook for one more minute. Add vegetable stock, tomatoes, tomato paste, carrots, basil, salt and pepper. Heat to a boil then reduce to a simmer. Add green beans, kidney beans and pasta and cook about 15 minutes until pasta is cooked. Sprinkle with grated parmesan cheese. I haven’t shared a recipe in ages! That’s probably because I haven’t been making share-worthy food. Between playing “Campaign Manager” for my husband’s School Board race, training for the Chicago Marathon, taking on a new part time job and managing the craziness of a household of five, there simply hasn’t been time to get creative in the kitchen. On this Election Day Eve I invited family over for dinner to map out our plan for manning all EIGHT polling locations in our school district tomorrow. I needed a meal that could feed a big group and that I could make ahead and pull out of the oven when my in-laws arrived. Leftovers for tomorrow night after standing outside holding my husband’s campaign signs all day would be pretty wonderful too. 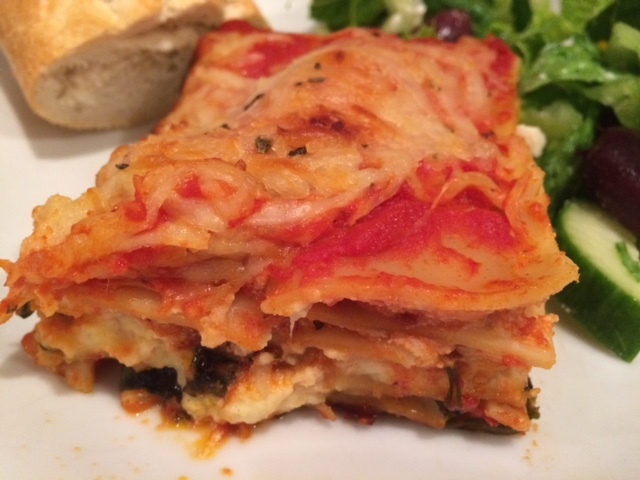 A warm and hearty lasagna seemed to fit the bill. Since I don’t eat meat, I always stick to a vegetable based lasagna. I’ve made several recipes, but had never created a recipe of my own. This afternoon I was feeling inspired. Here’s what I came up with. All my toughest critics told me it was “a keeper” so I’m sharing it with you. Now, I’m not going to say this recipe is the “lightest” one I’ve ever created, but it is perfect for special occasions with family and would be great for upcoming holiday gatherings. Cook lasagna noodles according to package directions. I usually add a bit of EVOO to the water to prevent the noodles from sticking together. Drain and set aside. Once cooled enough to handle I hang them over the side of the colander or pot to keep them from sticking together. Heat oil and butter in a large skillet. Add onions and garlic. Heat for 2 minutes or until fragrant. Add mushrooms and cook until the water cooks out of them and until they are nicely browned. Add marinara and stir to combine. 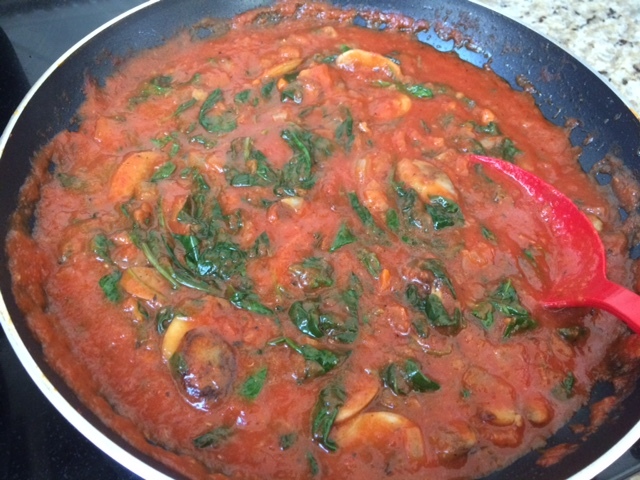 Gradually add spinach and let it wilt down into the sauce. Add basil. Simmer 5 to 10 minutes and set aside. In a medium bowl combine ricotta, parmesan, 1 cup of mozzarella, egg yolks, nutmeg, salt and pepper. Stir well and set aside. In a 13 x 9 casserole dish, spread a bit of the red sauce. Use three or four lasagna noodles to make a layer on the bottom. Cover with cheese sauce, red sauce, then noodles. Repeat ending with a final layer of noodles and the remaining sauce. Top with remaining mozzarella cheese and a sprinkle of basil. Bake uncovered at 375 for 30 minutes or until cheese is lightly browned and bubbly.